Aizawl, September 6, 2014: Tv (Dr). 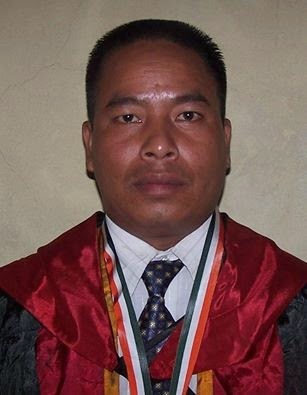 Zomuana Zote, S/o Tlanglawma, Kanan Veng, Aizawl chu Department of Library & Information Science, Mizoram University (MZU) chun thla hmasak August 25, 2014 khan Doctorate Degree a lo inhlân tah. A thesis ziek hi “Resource Generation & Mobilisation in College Libraries in Mizoram” ti a nih. Dr. Zomuana Zote hin subject 2 ah Master Degree neiin, kum 1993 khan NEHU hnuoi-ah MA (Sociology) ṭha taka a zo hnungin MZU hnuoi-ah M.Lib a'nchûk nawk a. M.Lib hi First Class-a pass in Gold Medallist a ni nghe nghe a nih. M.Lib a zo hnung hin research (Ph.D) thaw nawkin August 25 khan MZU chun Doctorate Degree a lo inhlân fel tah a nih. Ama hi Khawlian (Mizoram) khuo suok niin tuhin Kanan Veng, Aizawl-ah in-le-lo nghet tak neiin sungkuo a khawsa mek a nih. Ama hi Govt. Aizawl North College-a Librarian sin chel lai zing a ni bawk.